Happy December! Today's manicure is the first in a new holiday series... the 12 Manicures of Christmas! My nails are brimming with sparkly festivities! I have a LOT of layers on my nails, I know. Smokin' from SinfulColors is a new addition to my collection per Black Friday shopping. I definitely broke my no buy... which I half regret. The other half of me really likes the iphone case I bought. Inner turmoil, and all that. Smokin' is a medium grey creme polish, and it's a lot like Impeccable Greys from Maybelline, only a few shades lighter and a smidge less violet-toned. I found it at Big Lots for $1 on Black Friday! 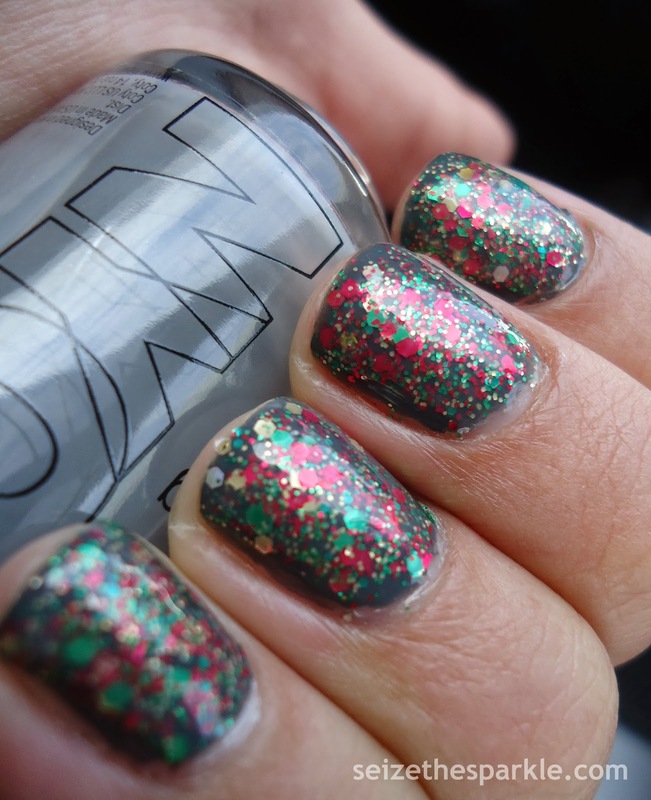 I knew almost immediately that I wanted to pair it with some glitter and top it off with my Grey Jelly Franken. At first, I thought I'd use Holiday Rebel from SinfulColors. But there wasn't enough green. Then I added Purge from L.A. Girl. Not enough red, and the whole mix needed gold! In the end, my Christmas Franken is a To-Taste mix of SinfulColors Holiday Rebel, L.A. Girl Synergy, SinfulColors Decadent, Wet n Wild Fergie Glamorous, China Glaze Twinkle Lights, and L.A. Girl Purge. Christmas-y Goodness, Elf Pee, Reindeer Puke... Whateeeever you'd like to call it. I think in order for it to qualify as a "puke" or "pee" polish, it has to have flakies, and alas... it does not. *sad face* But there's room for improvement... and room for more polish in the bottle! I felt like the layering was a bit sparse on red glitter, so I added in some dabs of Decadent before finishing off my Jolly Glitter Sandwich with 2 Coats of my Grey Jelly Franken. That's a mix of NYC clear and Pure Ice Kiss Me Here. 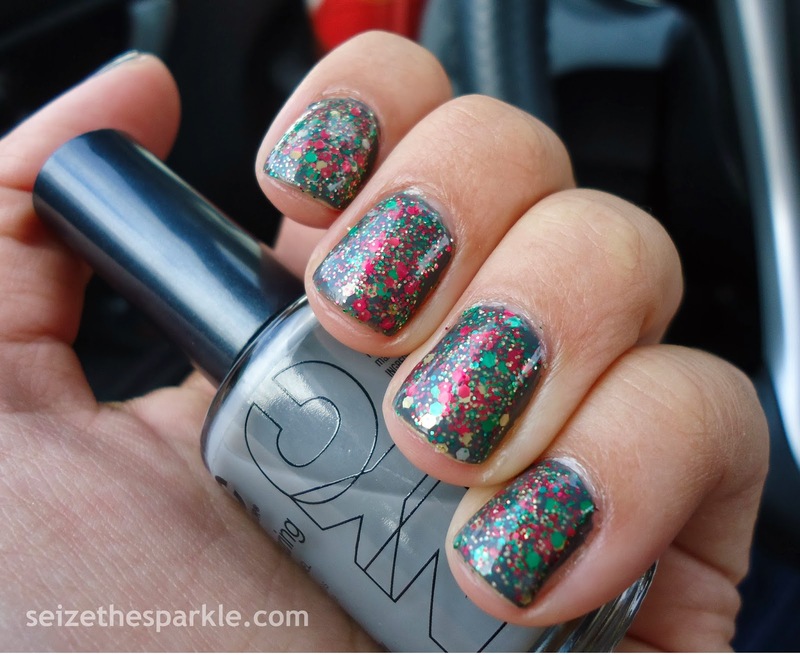 It's a great neutral to top off a glitter sandwich without compromising the color of the glitter or the base coat. What do you think of my City Sidewalks Layering?